Negative Gearing. Who uses it and why? How much does it cost? What does it achieve? What are its risks and rewards? Should it be changed? How? What will that do to property? To the economy? Just a few of the questions answered in this special report that reveals all about Australia’s most controversial tax haven. 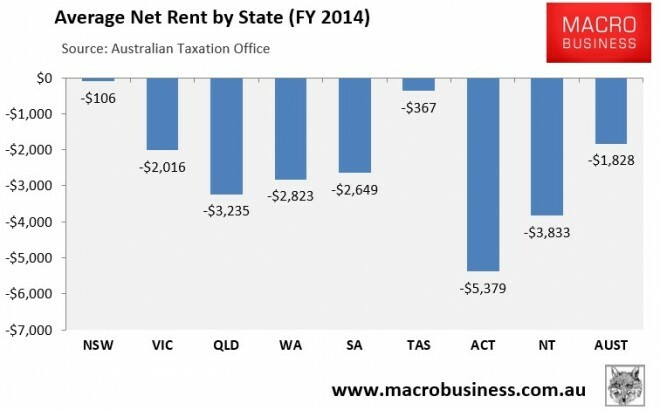 Last week, the Australian Taxation Office (ATO) released its Taxation Statistics for the 2013-14 tax year, which once again revealed that Australia is a nation of loss-making landlords. If there is one thing that differentiates the Australian housing market from most others, it is the propensity for Australians to leverage into buy-to-let investment properties in the face of negative income returns, in the expectation that capital appreciation will repay debt and interest. ‘Negative gearing’, as it is known in Australia, is a popular form of leveraged investment in which an investor borrows money to buy an asset, but the income generated by that asset does not cover the interest on the loan. By definition, a negative gearing strategy can only make a profit if the asset rises in value by enough to cover the shortfall between the income received and the costs incurred from the asset. Alternatively, a negatively geared property may become neutrally or positively geared following a period of rental increases. Australia’s negative gearing rules are unusual in that they allow investors, in both property and shares, to write-off the cost of borrowing used to acquire an asset in addition to other holding costs against all sources of income (including labour income), not just the income generated by the asset. There are also no limitations on the income of the taxpayer, on the size of losses, or the period over which losses can be deducted. 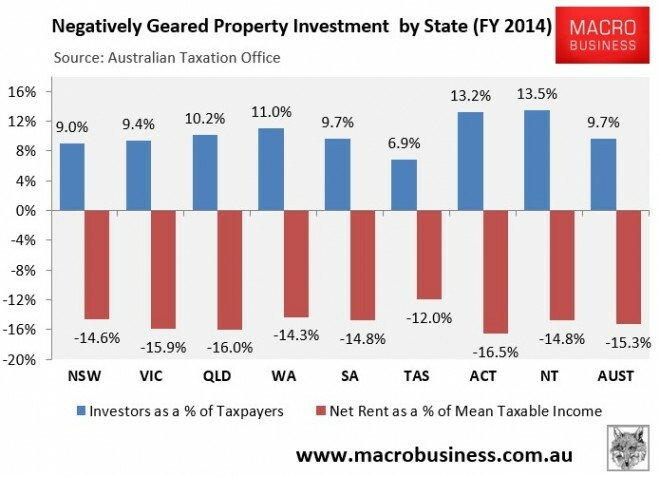 By contrast, in most other countries, rental property expenses cannot be deducted against unrelated labour income, which effectively limits negative gearing to professional investors and developers. The three basic features of a typical tax shelter are the absence of a full nominal capital gains tax, the deductibility of full nominal interest expenses, and a mis-match in the timing of the deductions and the recognition of taxable income (for example, because capital tax is payable on a realisations rather than accrual basis). Rental property investment clearly exhibits each of these features, as do some other activities, and so effectively obtains tax benefits under the current tax system. Prime Minister Malcolm Turnbull has made similar observations, noting in his 2005 tax policy paper that negative gearing and its partner-in-crime, the capital gains tax (CGT) discount, were a “sheltering tax haven” that is “skewing national investment away from wealth-creating pursuits, towards housing”, and has caused a “property bubble”. Turnbull also admitted that “Australia’s rules on negative gearing are very generous compared to many other countries” and that “the normal deductibility principles do not apply to negatively geared real estate such that the taxpayer is not obliged to demonstrate that the negatively geared property will generate positive cash flow at some point in the distant future”. When combined with the Howard Government’s decision in 1999 to change the nation’s CGT rules, by halving the rate of tax payable on capital gains earned on assets held for more than 12 months, Australia’s strong house price appreciation since the late-1990s has allowed investors to make strong after-tax returns. There is a dark side, however, with investors increasingly crowding-out first home buyers from the property market, consigning an increasing proportion of younger Australians to a life time of rent, or paying-off jumbo-sized mortgages. 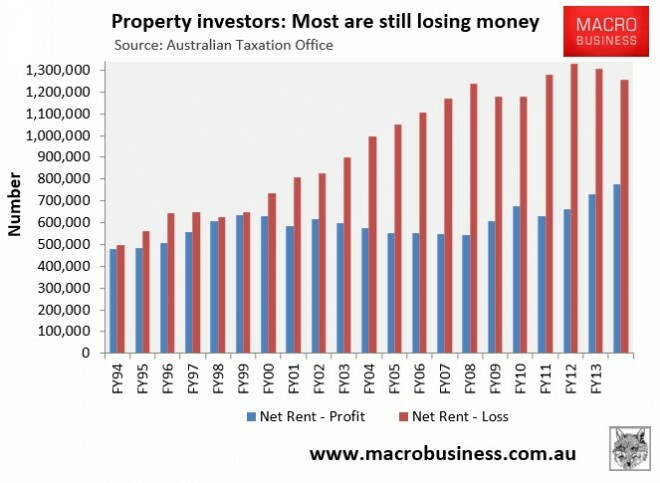 Australia has experienced a surge of negatively geared property investment (and property investment more generally) from the late-1990s . There are two main reasons for this. First, financial deregulation led to a surge of new loan products in the mid-1990s, including those targeted at investors. These included interest only loans, as well as the new found ability to purchase an investment property through accessing equity in one’s existing home, without having to put in any cash up front, effectively allowing 100% debt financing of an investment property. Second, the Federal Government’s decision, in 1999, to halve the rate of CGT payable on capital gains earned on assets held for more than 12 months encouraged investors to speculate on rising housing values with the full knowledge that any losses would reduce their overall tax liability, and any capital gains would be taxed at only half the rate of labour income. 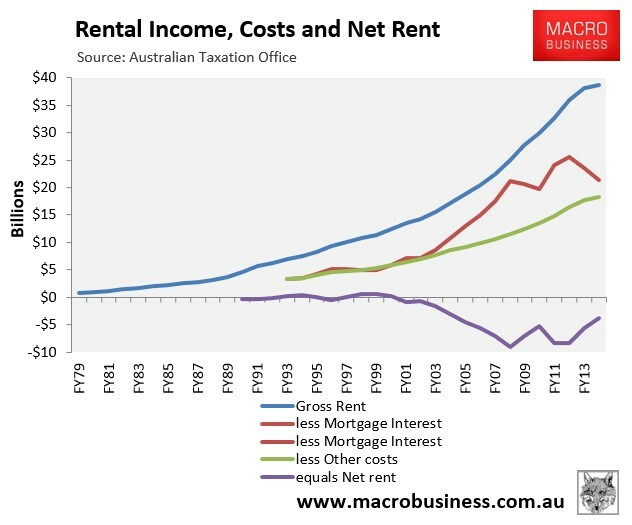 Indeed, the ability of investors to minimise tax via negative gearing, combined with easier access to credit and the halving of CGT in 1999, has seen Australia become a nation of landlords (see next chart). In 1986-87, 510,810 taxpayers – 6.1% of the total – reported net rental income to the Australian Taxation Office (ATO). But in 2013-14, 2,033,973 did – 15.7% of total taxpayers. Moreover, in 1998-99, the number of investors claiming net rental profits (i.e. ‘positively geared’) was roughly equal to those claiming net rental losses (i.e. ‘negatively geared’). 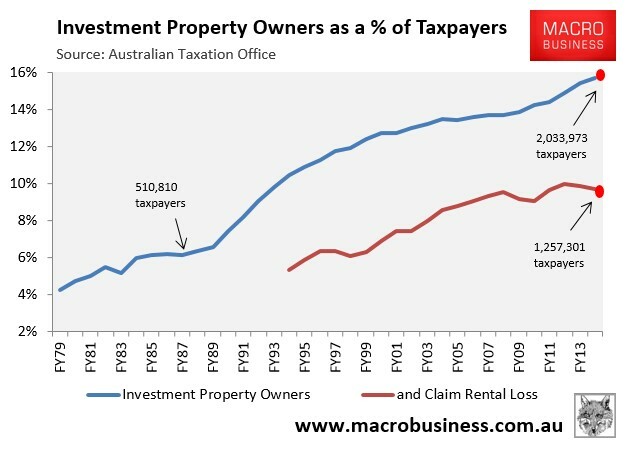 However, after the rate of CGT was halved, the situation changed markedly, with the latest ATO data showing that there were 1.26 million negatively geared property investors in Australia in 2013-14, representing 62% of all property investment (see next chart). Similarly, up until 2000 property investment was more or less neutral from an income perspective, with aggregate rental receipts covering costs. From 2000 onwards, however, net rents deteriorated sharply; with aggregate losses totaling $3.7 billion in 2013-14 (see next chart). The worsening rental returns since 2000 are primarily accounted for by the strong appreciation of house prices relative to weaker rental growth (see next chart). 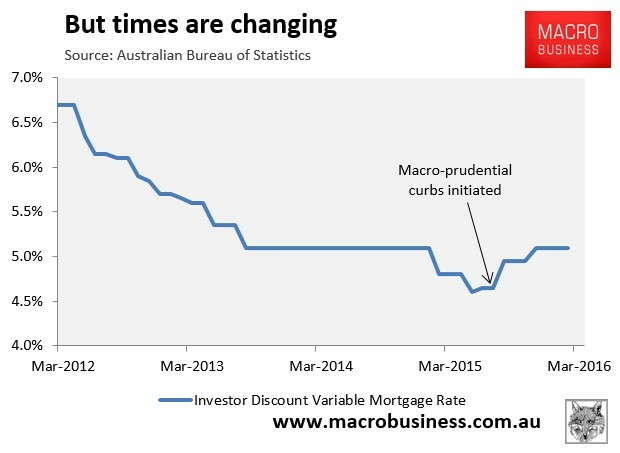 However, falling mortgage rates have cushioned the blow for property investors. In 1995-96, your typical investor faced an average standard variable mortgage interest rate of 10.4%. By 2013-14, this had fallen to just 6.0%, or around 5.1% after discounting. Indeed, aggregate rental losses in 2013-14 ($3.7 billion) were far lower than the 2007-08 peak when property investors claimed a record $9.1 billion of losses. They were also well below the $5.7 billion of losses claimed in the prior financial year (2012-13). The fall in rental losses over this period was due primarily to the sharp reduction in mortgage rates – from an average of 8.8% in 2007-08 to just 6.0% in 2013-14 – which dramatically reduced the amount of mortgage interest payable. We have probably witnessed the bottom of the negative gearing loss cycle, however, due to a number of factors. First, the average mortgage rate only reduced by 0.18% between FY2014 and FY2015. 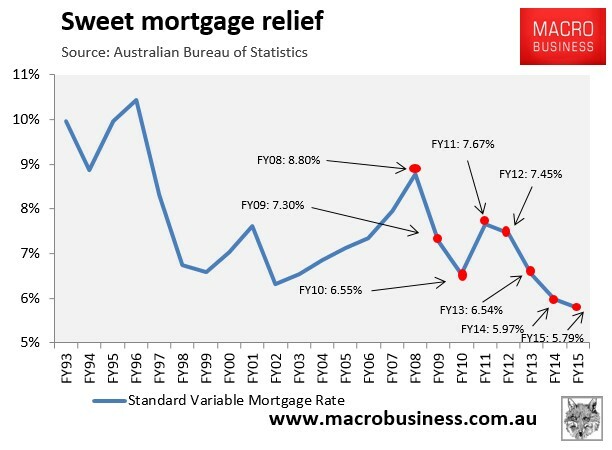 Moreover, thanks to the banks’ and APRA’s recent macro-prudential crackdown on investor lending, including the 10% ‘speed limit on investor mortgage growth, discount variable mortgage rates for investors have since risen from 4.65% as at June 2015 to 5.10% as at February 2016 (see next chart). The screw will continue to be tightened this year. Moreover, the Basel committee, which oversees prudential regulators like APRA, has recently flagged that the concessional capital treatment on investor home loans may need to be increased. Second, while investor mortgage rates have bottomed, both rents and rental yields are plumbing record lows. According to Core Logic-RP Data, annual rental growth was zero in both January and February – the lowest level in recorded history (see next chart). RP Data has also warned that “rental rates could begin to fall on an annual basis due to additional new rental supply entering the market”. 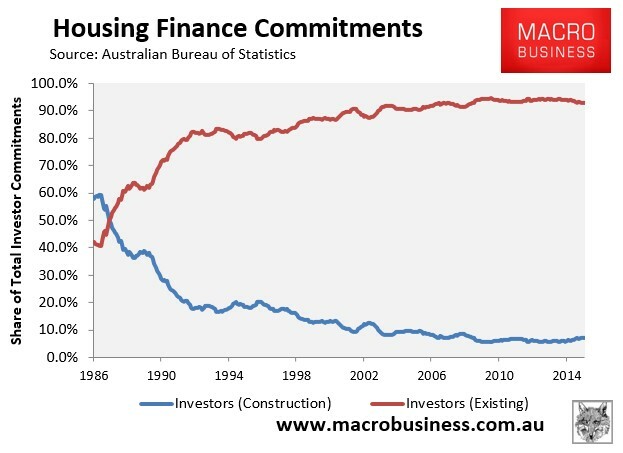 Finally, the number of property investors is likely to have risen since FY2014, as evidenced by the big acceleration in investor finance commitments, which has only recently begun to reverse (see next chart). Between June 2014 and June 2015, the total annual value of investor mortgage commitments rose by 14% from $266 billion to $302 billion (see red dots above). 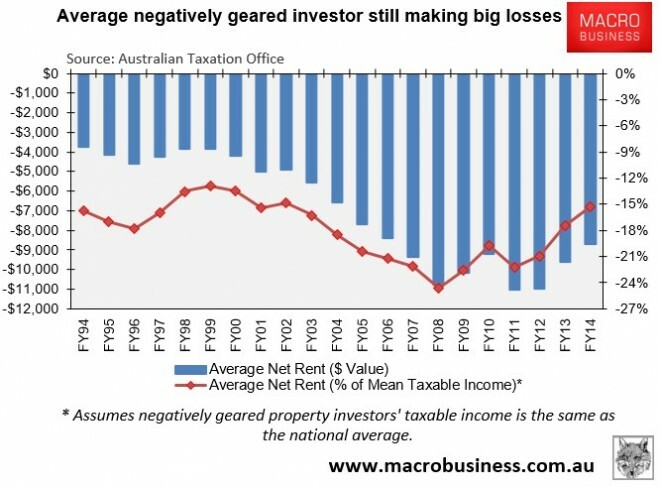 Given the large rise in property investors entering the market, along with the erosion of both rental growth and rental yields, and the lack of mortgage relief, there is a good chance that negative gearing losses will show an increase when data for 2014-15 is released by the ATO next year. Thanks to the large fall in mortgage rates in 2013-14, the average loss across all investment properties nationally was only $1,828 per investor, or 3.2% of average taxable income (see next chart). However, losses for negatively geared investors remained high, averaging $8,722 per investor in 2013-14, or 15% of average taxable income (see next chart). 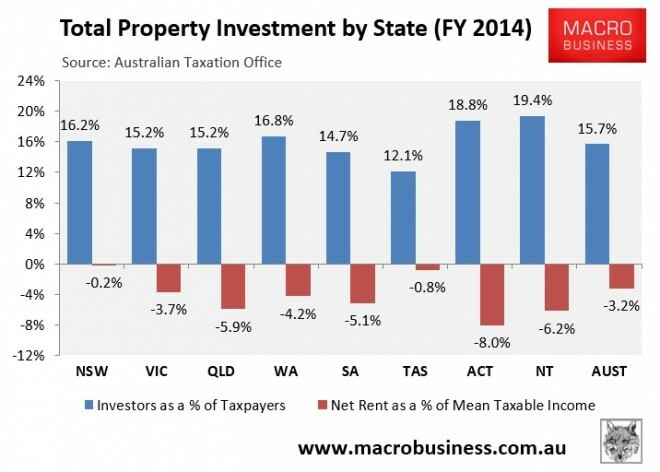 At the state and territory level, property investment is most pervasive in the Northern Territory and the ACT, with those two jurisdictions also incurring the highest income losses (see next chart). Over the past year we have witnessed a growing political appetite for negative gearing reform due to the deleterious impacts on housing affordability negative gearing has and its ongoing drain on the Federal Budget. In mid-2015, the Australian Greens released their policy to quarantine negative gearing so that rental losses on both houses and shares could no longer be claimed against unrelated wage/salary earnings. Under the Greens plan, those already holding negatively geared investments would be grandfathered, with the changes only affecting new investors from a specific date. The Greens also proposed to remove the CGT discount for all capital gains realised on or after a specific date. Instead, individuals would be able to index their cost base by the consumer price index (CPI) so that tax is only applied to real capital gains, thus returning the system back to its pre-1999 settings. The Parliamentary Budget Office (PBO) estimated that these two reforms would improve the Budget balance by nearly $7 billion over the four-year forward estimates period, along with ongoing Budget benefits. However, the most important announcement in a generation on negative gearing came from the Labor Party, which vowed that if it wins the upcoming Federal Election it will limit negative gearing to newly constructed housing only from 1 July 2017, with all investments made before this date not affected by this change and fully grandfathered. This means that from 1 July 2017, losses from new investments in shares and existing properties can still be used to offset investment income tax liabilities (and carried forward to offset the final capital gain on the investment), but they cannot be deducted against unrelated wage/salary earnings. Labor has also vowed to halve the CGT discount for all assets purchased after 1 July 2017, thus reducing the CGT discount for assets that are held longer than 12 months from the current 50% to 25%. Again, all investments made before this date will not be affected by this change and will be fully grandfathered. The independent Parliamentary Budget Office has costed the impact of this policy as improving the budget by $565 million over the forward estimates, and $32.1 billion over the decade (see below table). The ALP’s negative gearing and CGT policy is a winner, both fiscally and economically. By grandfathering existing investors, political backlash would be minimised from the circa 1.3 million Australians holding negatively geared properties, thus making it a realistic reform option. Nevertheless, there would still be a significant dampening effect on the housing market, since home prices are set at the margin by new entrants. 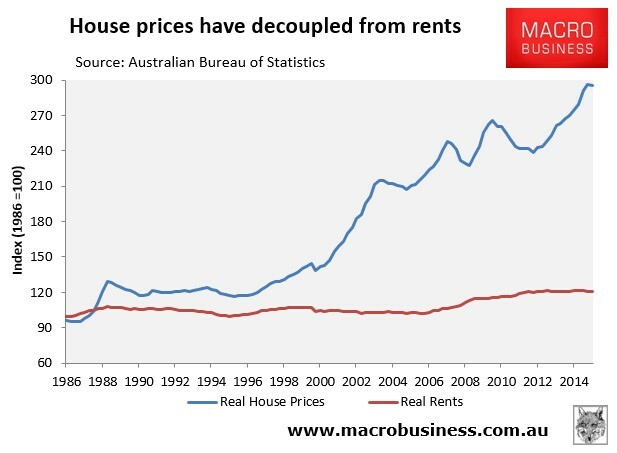 The resulting ‘correction’ in home prices resulting from Labor’s policy would, therefore, likely be far more orderly than if negative gearing was banned outright, since it would not cause a sudden flood of sales from existing investors exiting the market. At the same time, limiting future negative gearing to new builds would help to boost dwelling supply, dampening both prices and rents, and increasing economic activity. Still, despite the overwhelming arguments in favour of Labor’s policy, it hasn’t stopped Australia’s conga-line of property lobby rent-seekers from crying foul. And unfortunately their cries of woe have been embraced by the Turnbull Government, which has vowed to maintain the status quo. This comes despite Malcolm Turnbull’s previous admission that negative gearing and the CGT discount were unproductive “tax shelters”, along with Treasurer Scott Morrison’s admission on Sunrise that there were “excesses” in negative gearing that needed to be reined-in. At this juncture it is worth evaluating the Turnbull Government’s (and property lobby’s) key arguments against Labor’s negative gearing and CGT policy. Treasurer Scott Morrison, who used to be head of research at the Property Council of Australia, has repeatedly made the claim that ‘ordinary’ ‘middle’ Australians are the primary beneficiaries of negative gearing and that Labor’s policy represents a direct attack on them. In Australia, private rental accommodation is supported by a large pool of mum and dad investors making private rental stock available, through negative gearing. By number, almost 80% of these investors are middle income Australians earning $80,000 a year or less, owning just one property. They are school teachers, police officers, nurses and office workers saving and investing to provide for their financial security. “[Shadow treasurer] Chris Bowen thinks everyone who’s on negative gearing is on a rort,” he said. “He thinks they’re big property barons and you’ve got to go and tax them and slam. There are several ways to assess this claim. First, let’s look at the “taxable income” figures from the 2013-14 ATO statistics. Taxable income is what is left after legitimate deductions such as negative gearing are accounted for. For example, if someone earning $88,000 a year in 2013-14 claimed the average negative gearing loss of $8,722 that year, then their taxable income would be reduced to $79,278, thus making them appear to be a lower income earner than they actually were. It is also important to note that the average taxable income in 2013-14 was only $57,134. 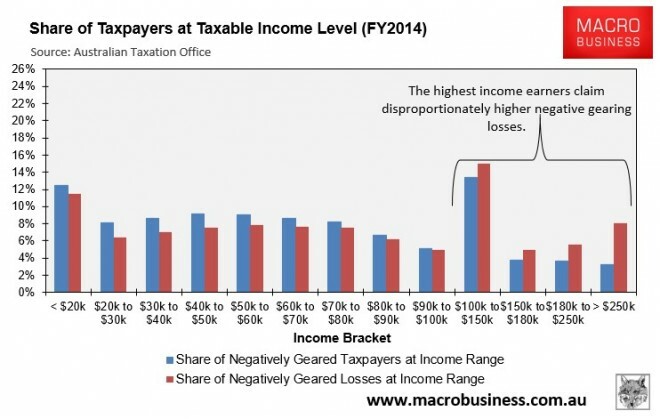 The ATO statistics for 2013-14 shows that the number of negatively geared taxpayers was significantly under-represented at the lower taxable income levels and over-represented at the higher taxable income levels (see next chart). In 2013-14 there were 597,057 people with a taxable income below $60,000 claiming negative gearing losses on an investment property, but 660,244 people earning above $60,000 claiming negative gearing losses. The picture gets worse when the dollar value of losses, rather than the number of users, is examined (see next chart). According to the ATO statistics, those with taxable incomes below $60,000 claimed 40% of total negative gearing losses, whereas those earning above $60,000 claimed 60% of the total negative gearing losses. 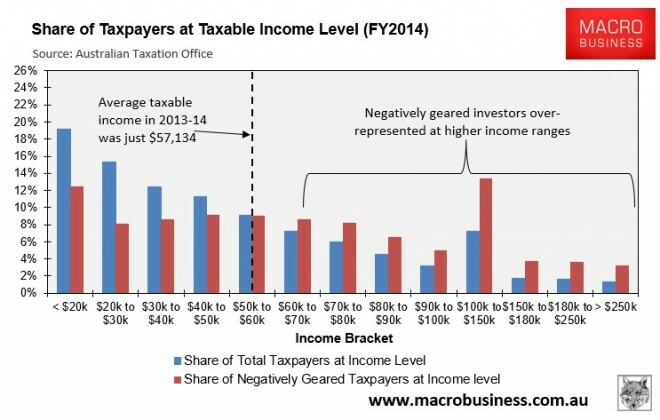 Moreover, the percentage of income earners in each tax bracket claiming negative gearing losses tended to rise with income (see next chart). 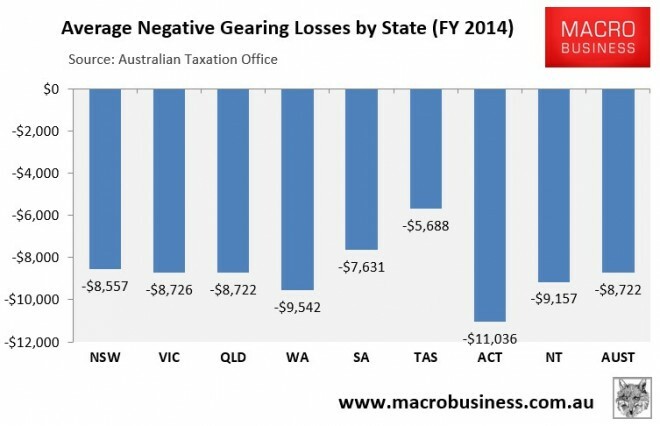 As does the average negative gearing loss claimed (see next chart). One major drawback of using taxable income to assess which income groups derive the most benefits from negative gearing is that it itself is understated by the amount of negative gearing losses (which are deducted from gross income) and it does not include non taxable forms of income, such as superannuation earnings. Thankfully, the Household Income and Labour Dynamics (HILDA) survey overcomes these shortfalls by displaying total income. 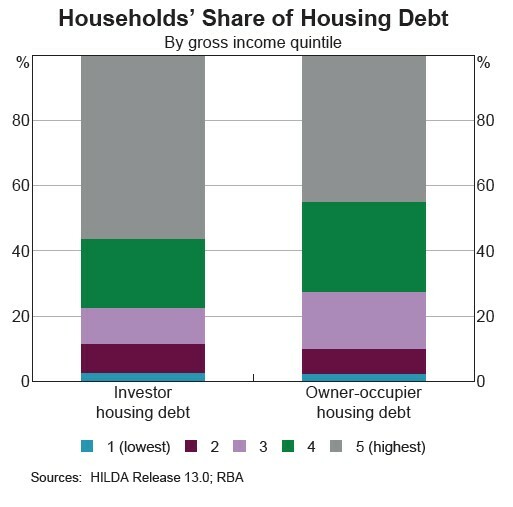 According to the RBA’s analysis of the HILDA data, nearly 80% of total investment property debt is held by the top 40% of income earners (see next chart). 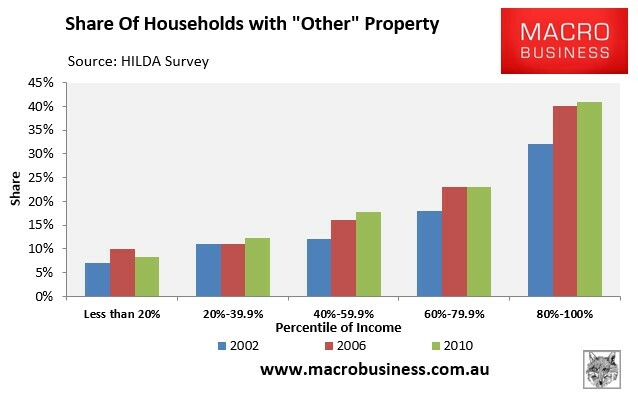 The proportion of households owning “other” property (i.e. investment or holiday homes) also rises with income, with 64% of households in the top two income quintiles holding “other” property versus just 21% of households in the bottom two income quintiles (see next chart). 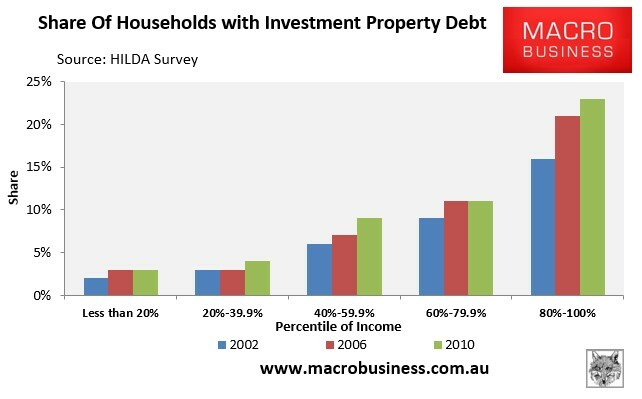 Similarly, 34% of households in the top two income quintiles held investment property debt in 2010 versus just 7% of households in the bottom two income quintiles (see next chart). 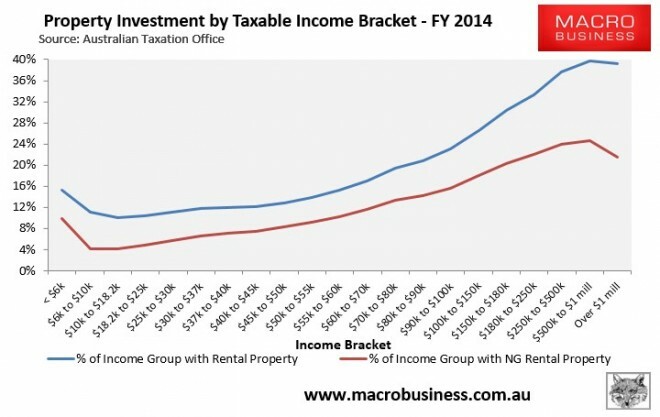 Given the above data, it seems clear as day that higher income earners are the primary users and beneficiaries of negative gearing, and that they own the vast majority of Australia’s investment properties. Another oft-used argument by the Turnbull Government against Labor’s policy is that it would force-up rents. “One of the major concerns is ensuring there is an ample amount of affordable rental properties… What the Labor Party is proposing is that people who own residential property that is tenanted… They will only be able to sell it to home buyers. So, over time the pool of rental stock will naturally decline. And so there will be fewer properties available to rent and rents will inevitably go up”. 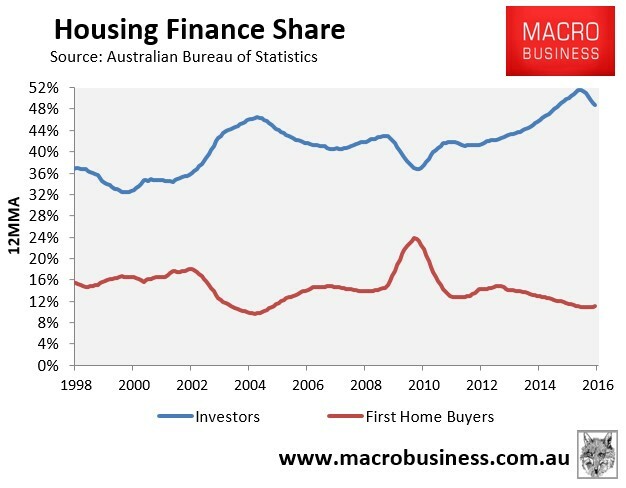 In evaluating the Turnbull Government’s claim it is worth first emphasising that 93% of investor loans are for existing dwellings, therefore, most investors are not actually increasing housing supply, but rather substituting homes for sale into homes for let (see below charts). 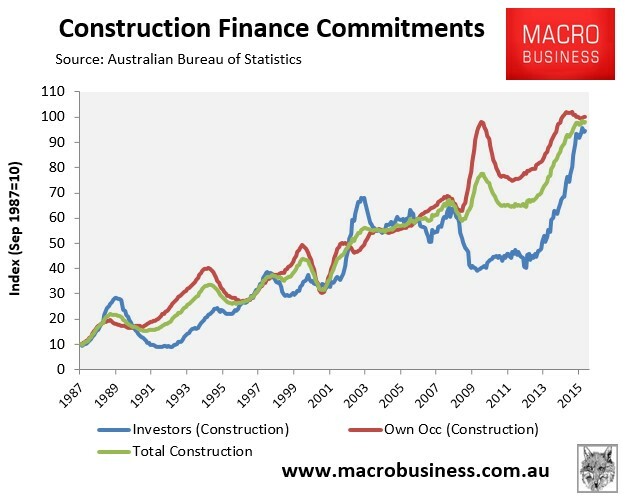 Moreover, since negative gearing was reinstated in September 1987, after it was temporarily quarantined for two years, investor construction loans have grown at a slower rate than construction loans to owner occupiers (see next chart). Based on the above data, it is wrong to suggest that negative gearing has assisted dwelling supply and helped to keep a lid on rents. Under Labor’s policy there would indeed be less “investment” (read transfer of ownership) in existing dwellings, but those homes would not magically disappear from the supply-demand equation. Rather, those homes would be purchased by an owner-occupier, thus reducing demand for rental properties by the same proportion as the fall in rental supply. 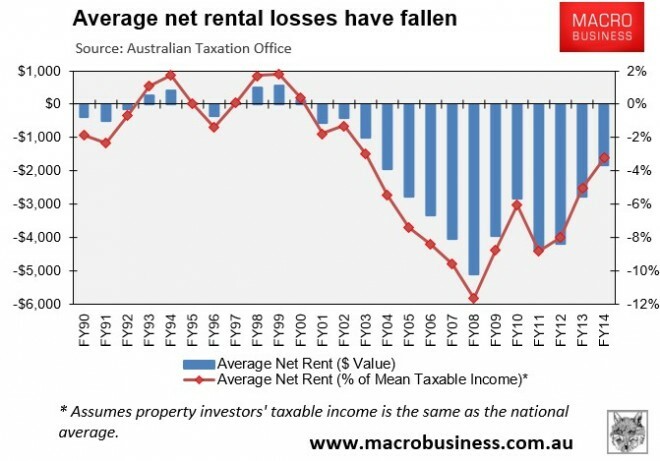 In this regard, Prime Minister Turnbull’s claim that “over time the pool of rental stock will naturally decline. And so there will be fewer properties available to rent…” is misleading because it completely ignores the fact that the pool of tenants would similarly decline as they become owner-occupiers. More importantly, because Labor’s policy would channel negative gearing towards new builds, dwelling construction would increase, as will the supply of rental accommodation. And this extra supply would lower rents, other things equal. It is also worth pointing out that Labor’s ‘new homes only’ negative gearing policy is entirely consistent with the state government’s changes to first home buyers’ grants, which were shifted to newly constructed homes several years ago in order to boost supply. The Turnbull Government’s claim that Labor’s policy would choke rental supply and force-up rents clearly does not pass scrutiny. If anything, the outcome would be the opposite: increased dwelling supply and lower rents. Prime Minister Malcolm Turnbull has also tried to argue that Labor’s policy would increase competition for first home buyers, thus reducing their prospects of home ownership. “The reason why housing is not as affordable or accessible as it should be is because we are not building enough houses. Now let me give you an example of what Labor’s policy would do. If you take – underlay this plan, the only housing that investors can invest in and deduct their losses against their income would be new housing. Now if you go out to the outer suburbs of Sydney or Melbourne you will find lots of new subdivisions and new houses and young couples will be buying house and land packages. And that’s – and they are the bulk of those buyers for that. Under Labor’s plan, they will now be competing with investors”. Another common argument used by the Turnbull Government against Labor’s policy is that it would “crush” productive business investment. “So at a time we need more investment, they’re increasing the tax on investments. Is that well thought out? I don’t think so. At a time when we want Australians to have a go and be enterprising, start new businesses, start small businesses, they are – they are – with their negative gearing policy they are going to prohibit anyone from offsetting an investment loss against their personal income unless it is a new residential property. …under the guise of housing affordability, you would not able to not only buy an existing flat or a house and negative gear it against your personal income, you couldn’t buy a shop, you couldn’t buy a warehouse, you couldn’t buy an office suite. What’s that got to do with housing affordability? You couldn’t buy a portfolio of shares in public companies. What’s that got to do with housing affordability? You could not capitalise with a partner a private company to start a business and offset that against your income. Now, the reality is that most of us start off with only our human capital and we start off in life earning some money for ourselves in our profession, in a job and we leverage that – we borrow money and leverage that to start something else. Labor is saying you can’t do that anymore”. This argument is misleading on a number of levels. First, Labor Shadow Treasurer, Chris Bowen, has already explained that its negative gearing policy would only apply to “passive” investments – like property and shares – not genuine “active” business investments. Thus, there would be no changes to the tax rules for genuine productive investments. Second, in his 2005 tax policy paper, Malcolm Turnbull described negative gearing and the CGT discount as a “sheltering tax haven” that is “skewing national investment away from wealth-creating pursuits, towards housing”. So why is the Prime Minister arguing the opposite now? Third, if there is one sector that is losing-out from the current taxation arrangements it is businesses. Perversely, the current tax rules allow individuals to claim unlimited negative gearing deductions for property investments into perpetuity, but if they invest in a productive side business, they must meet all kinds of criteria before they can claim losses against their wage/salary earnings, including showing a profit in three out of five years. Malcolm Turnbull knows this, which is why he also noted in his 2005 tax policy paper that “Australia’s rules on negative gearing are very generous compared to many other countries” and that “the normal deductibility principles do not apply to negatively geared real estate such that the taxpayer is not obliged to demonstrate that the negatively geared property will generate positive cash flow at some point in the distant future”. The data is also damning. 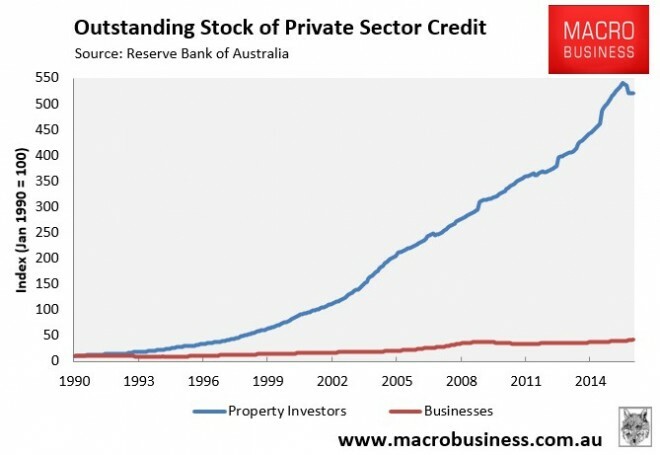 Since negative gearing was reinstated in 1987, lending to property investors has risen almost exponentially while business lending has flatlined (see next chart). It is precisely productive business lending, particularly lending to small enterprises, that is being crowded-out by housing lending. 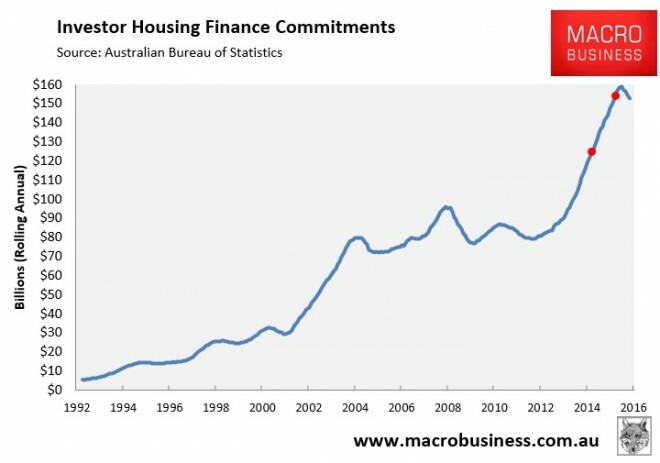 The sad reality is that in addition to draining the budget of much needed revenue and eroding housing affordability, Australia’s combination of negative gearing and the CGT discount have also raised financial stability risks. Australia’s taxation system is… relatively generous to small investors in buy-­‐to-­‐let property compared with some other countries, because investors can deduct losses from their investments against wage income as well as other property income, and because capital gains are taxed at concessional rates. Given the value Australian (and other) households place on home ownership, policy should not unduly advantage property investors at the expense of prospective owner-­‐occupier home buyers. Financial stability considerations would suggest that tax and regulatory frameworks should avoid encouraging over-­‐leveraging into property, whether by owner-­‐occupiers or investors. A key financial stability concern is that investors – where the decision to purchase property is based on weighing-up and considering alternative investment returns – are more likely to be fickle and cut-and-run as soon as conditions change, or more profitable opportunities are presented elsewhere. This places Australian housing on a more fragile footing than if demand was driven primarily by owner-occupiers, who tend to buy into housing for the longer-term. Expecting ongoing strong capital growth in the face of declining yield also suggests a very strong belief in the “greater fool theory”, and is ultimately unsustainable. 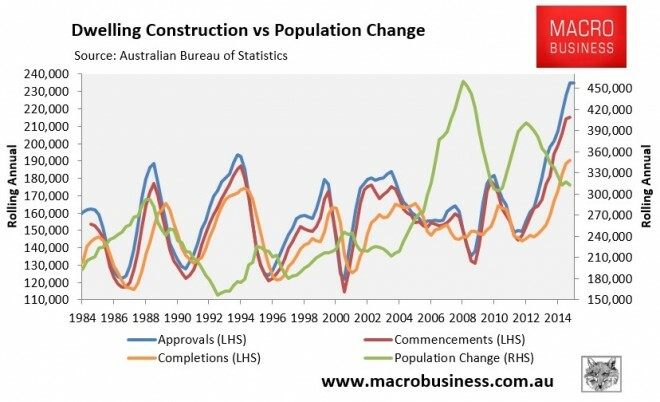 Adding to these risks is the fact that Australian housing valuations are already at their highest level on record and are continuing to grow just as rental growth has evapourated, due in part to the surge in dwelling supply against falling population growth (see next chart). Meanwhile, income growth is likely to remain anaemic for the foreseeable future as the unwinding of the biggest commodity price boom in the nation’s history continues to drag on the terms-of-trade and national incomes. These factors combined will ultimately reduce the scope for house price and rental growth, in turn diminishing the potential returns from housing speculation. That is before even considering any potential for a global shock that could impact on the borrowing costs of Australian banks, or any diminution of confidence by international ratings agencies in the sustainability of Australia’s budget deficit, which could also affect banks’ borrowing costs. What was a positive feedback loop that caused dwelling prices to rise could just as easily cause prices to fall, even without policy changes to curb negative gearing’s use. That is, once investors realise that Australian housing is ex-growth, there will be little incentive to invest in what is a loss-making endeavour. This could prompt a negative flow of investors into the market, depressing prices in the process. MB already foresees falling house prices and a high risk of an economic downturn in 2017, and we believe that Labor’s changes to property taxes would likely trigger bigger falls in house prices than would otherwise be the case. However, those falls would be offset economically by the benefits of a stronger for longer construction cycle (it is currently peaking), as well as lower interest rates and a falling dollar stimulating much more broad and swift growth in tradable sectors. Indeed, Labor’s reforms would release the RBA from its current bind of having to set interest rates to manage the housing bubble instead of the economy. Thus in the MB worldview, Labor’s reforms are more likely to be a part of an adjustment that shifts economic growth more suddenly from housing and consumption to productivity and tradables. The timing may not be ideal but that is the way Australian politics works and a desperately needed reform thirty years in the making is worth a few potential months of economic pain. Ultimately, there is no way to execute structural reform without pain. Labor’s reforms to negative gearing and the CGT discount represent a structural change that would boost the economy over the longer-term as it shifts the allocation of capital away from unproductive uses, like house price speculation, towards more productive uses, like genuine business investment. In fact, Prime Minister Turnbull’s goal of creating an entrepreneurial and innovative economy will be forlorn as long as the tax system continues to encourage Australians to leverage into unproductive housing.